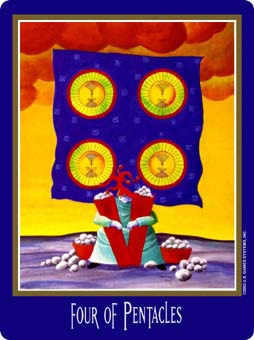 Cultivate a feeling of gratitude and make the best use of your advantage. 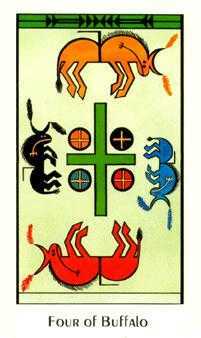 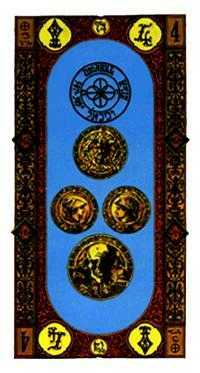 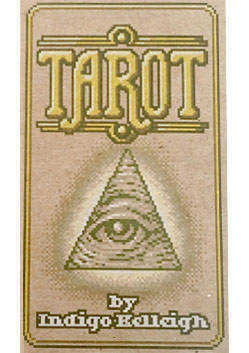 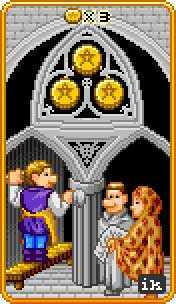 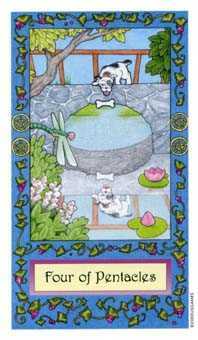 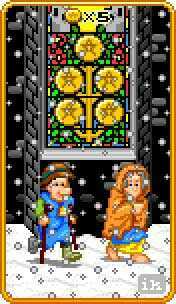 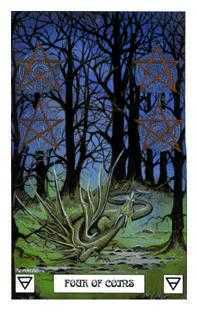 8-Bit Tarot deck © U.S. Games Systems, Inc. 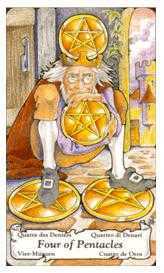 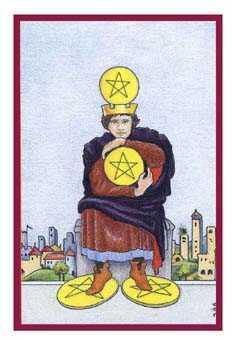 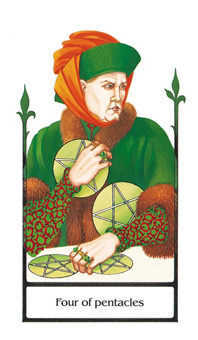 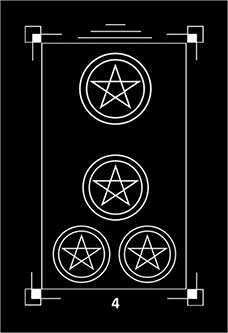 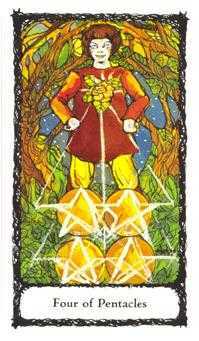 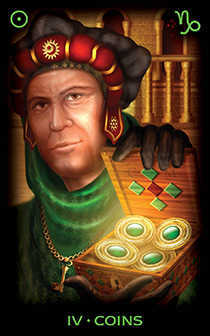 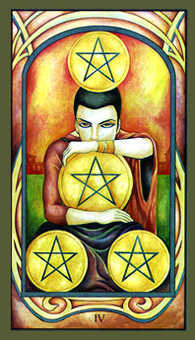 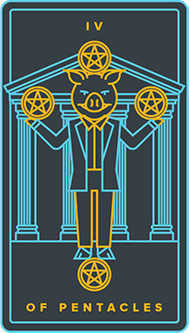 This suit, most often named Coins or Pentacles, is a symbol for a magical talisman that represented wealth or potential. 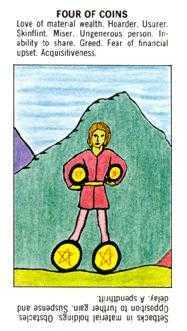 This suit represents something supportive that is available to you -- whether it be health, some kind of talent, a material or financial resource. 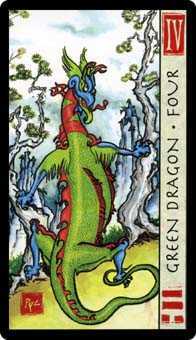 A Four in this suit has been used to express the paradoxical aspect of material security -- the two-edged sword of having been well supported and protected. 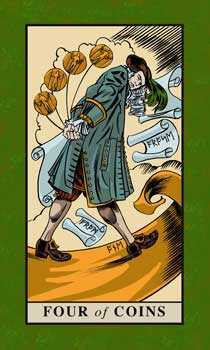 It sounds completely idyllic until one investigates the real demands that prosperity places upon people -- the pressure of big decisions, responsibilities toward dependents or employees, and even tougher decisions in times of insecurity. 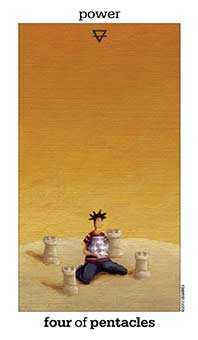 An immature person thrust into such a position would lack the perspective to sensibly assess risks and rewards, would be vulnerable to bad advice or surprise developments, and could even put the livelihoods of loyal assistants at risk. 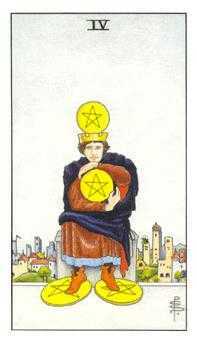 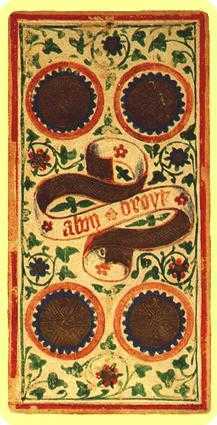 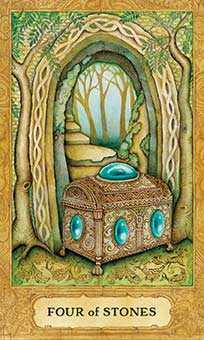 This card also can refer to the subtler dependencies that comfort encourages, allowing laxness and self-indulgence to quietly degrade one's reserve of will. 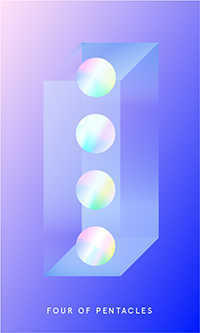 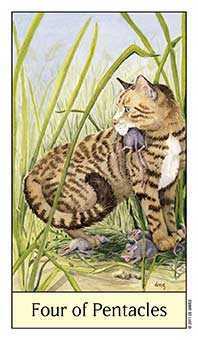 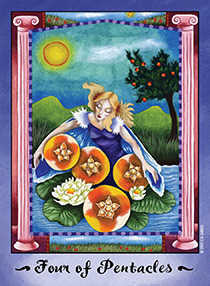 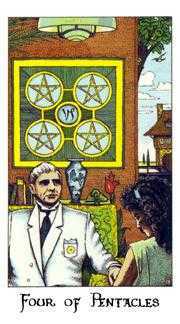 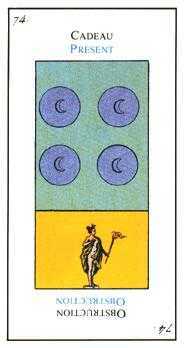 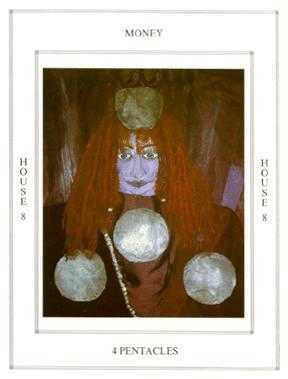 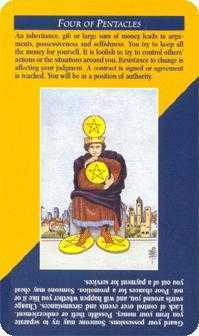 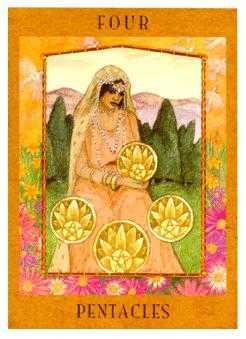 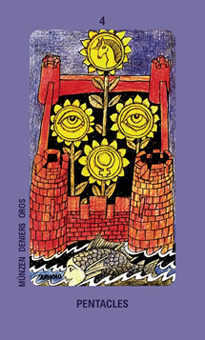 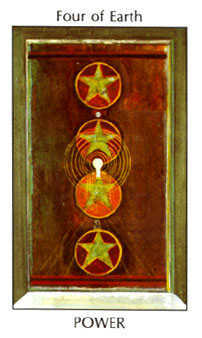 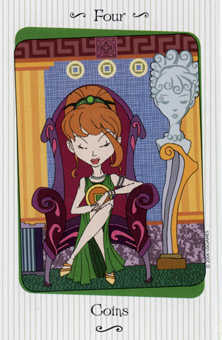 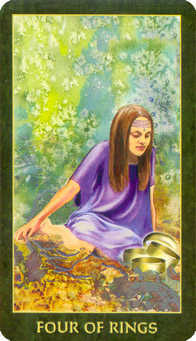 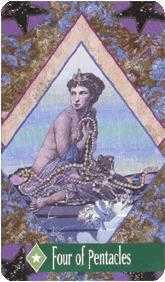 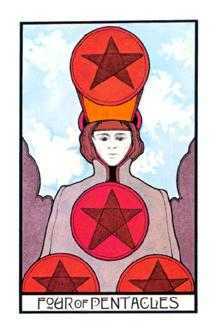 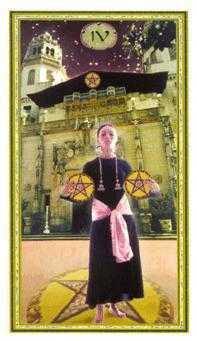 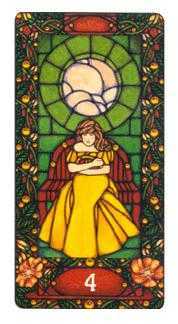 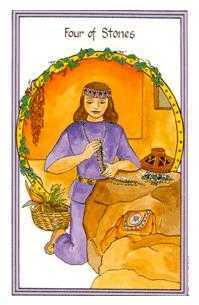 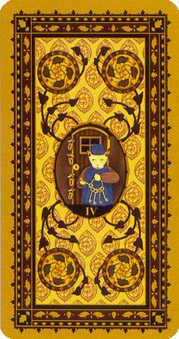 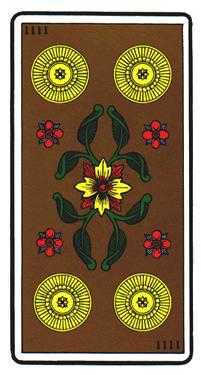 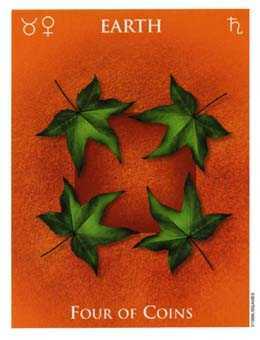 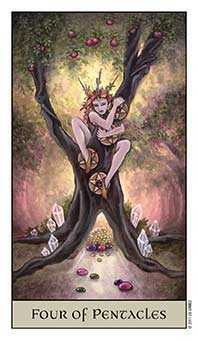 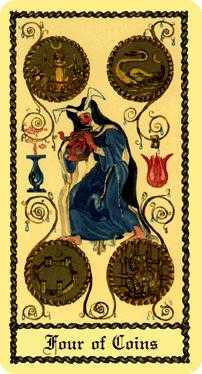 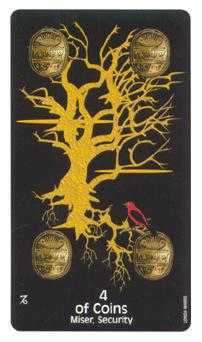 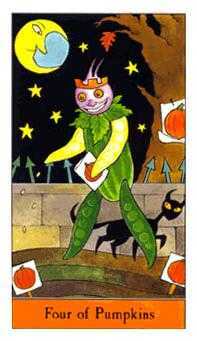 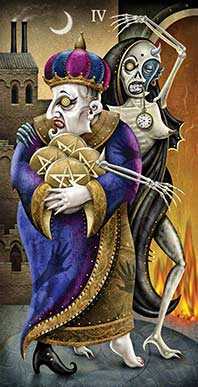 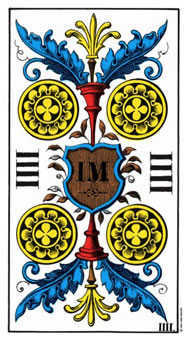 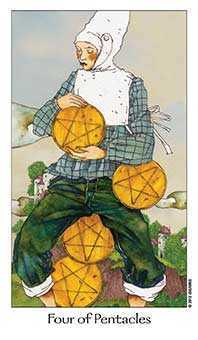 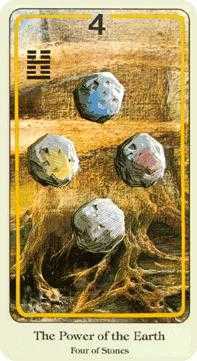 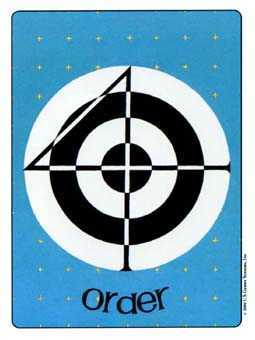 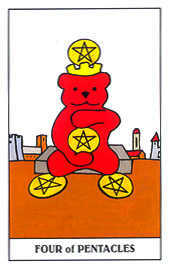 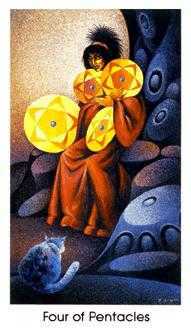 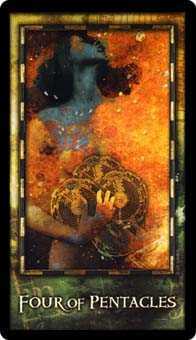 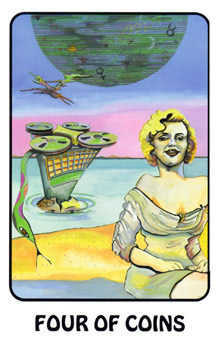 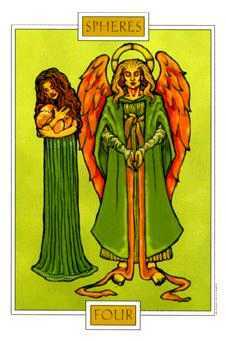 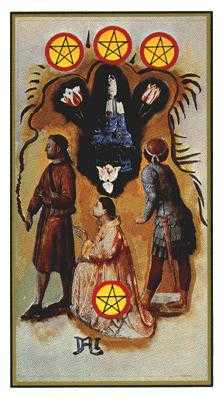 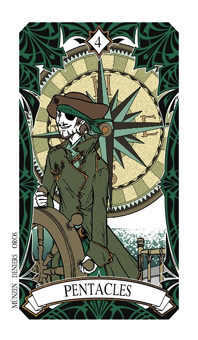 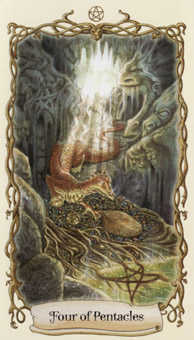 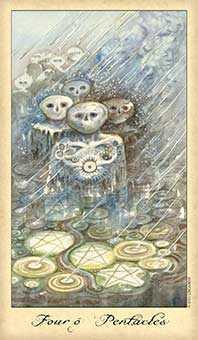 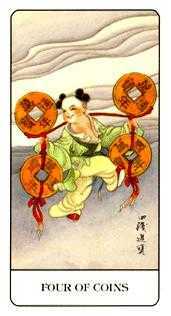 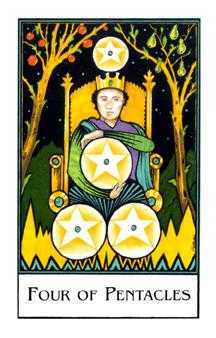 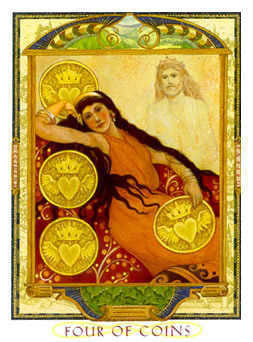 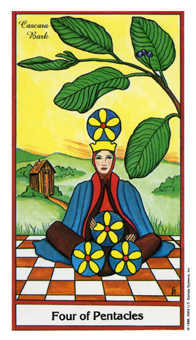 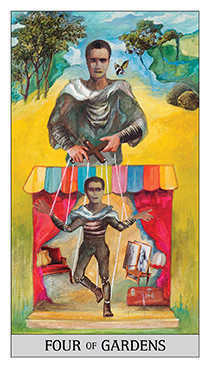 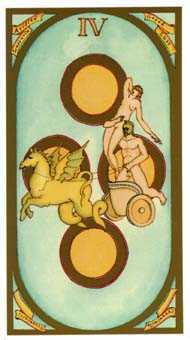 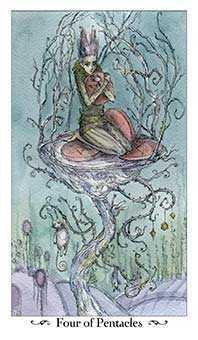 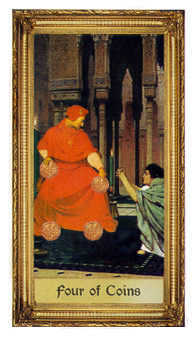 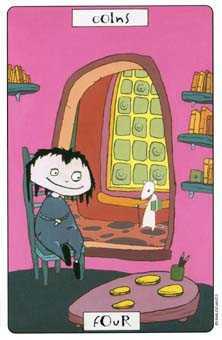 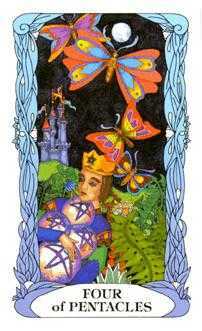 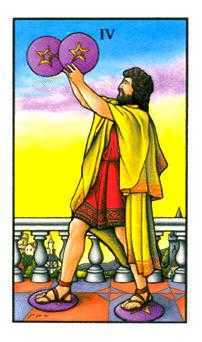 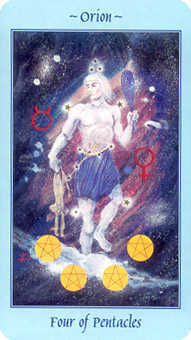 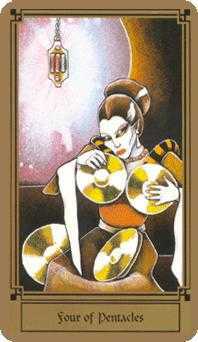 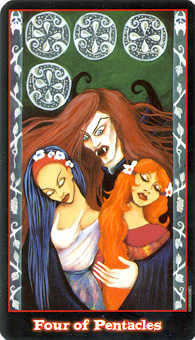 The character this card represents needs to move slowly and deliberately if change is required, as the consequences will affect more than just her or himself. 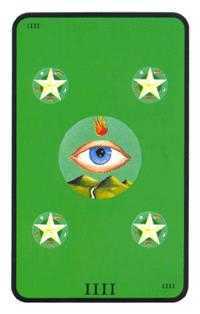 Note: In the English decks, like Rider-Waite, we see a person who is stuck in their misunderstanding of how the material plane works. 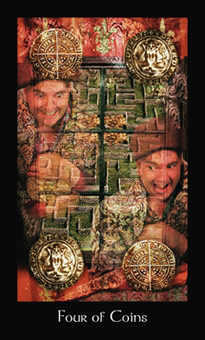 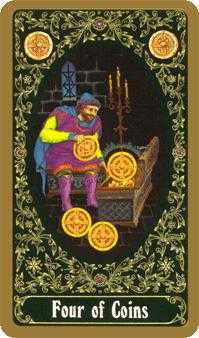 He's afraid to let go of his four measly coins, because he doesn't know he has to give in order to get. 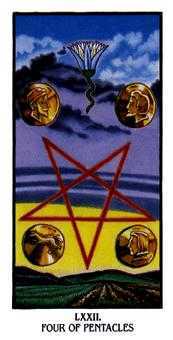 When looked at this way, this is the card of poverty consciousness. 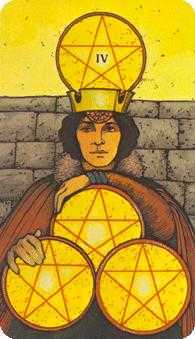 Study the responsibilities you have inherited rather than just looking at the advantages they represent. 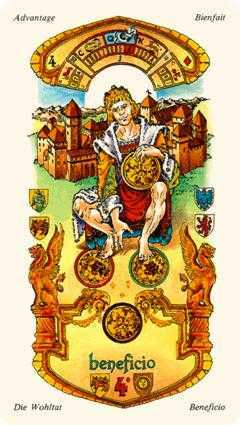 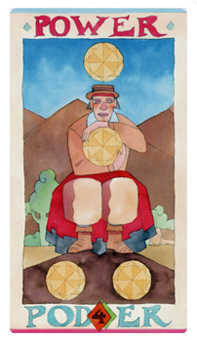 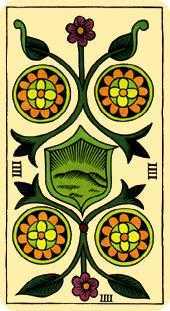 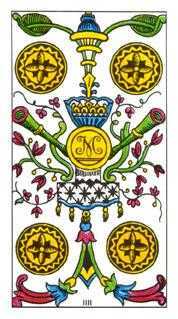 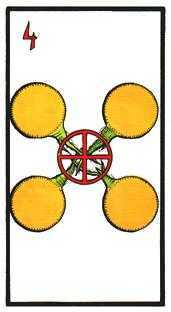 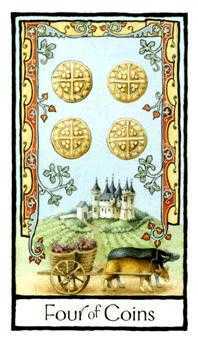 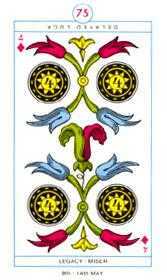 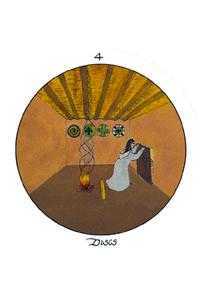 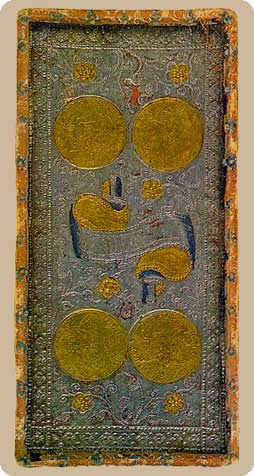 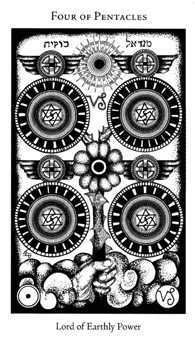 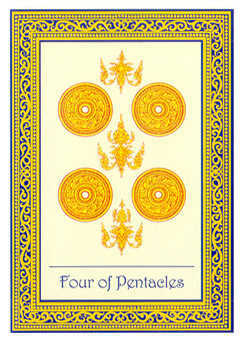 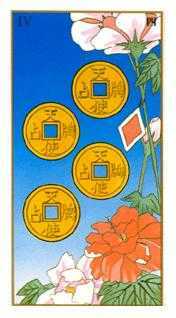 The Four of Coins in this position signifies a young person, naive and pampered, who has been left an estate. 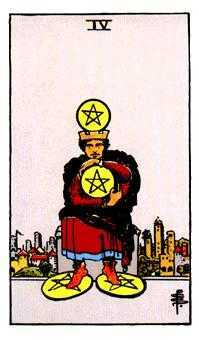 Think conscientiously about all those people whom your activities impact, including those whose work and effort went into building what you inherited and those whose welfare depends upon your right management. 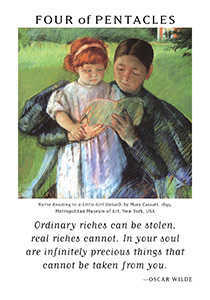 What you have been given is abundant; still, it is not without limits. 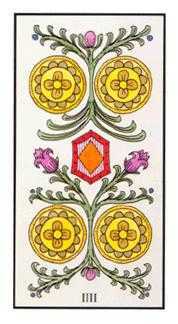 If you are prudent and responsible, the endowment will grow. 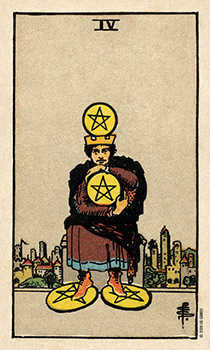 However, if you are frivolous or foolish, your behavior could undermine both your inheritance and the well being of others who are connected to it. 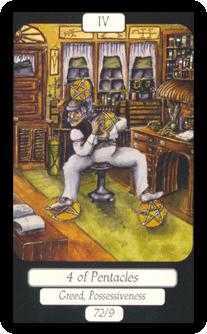 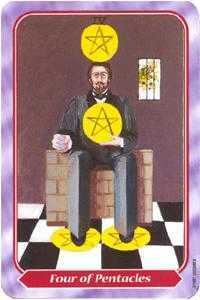 In many decks, we see the image of a person who is stuck in his or her misunderstanding of how the material plane works. 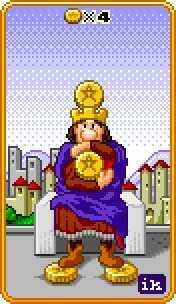 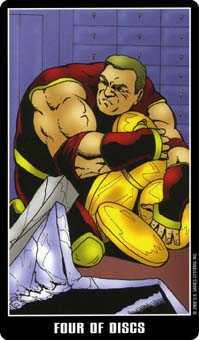 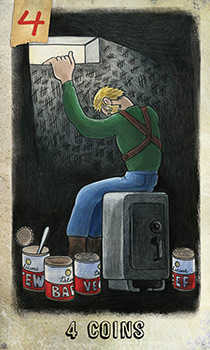 He's afraid to let go of his four measly coins, because he doesn't know he has to give in order to get. 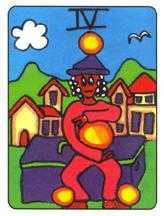 When looked at this way, this is the card of "poverty consciousness."